Greetings from Pinedale, Wyoming! After a trip to Jackson, we hitchhiked back to the route and continued on down the road refreshed as can be, thanks to the amazing hospitality of the Resor clan. [near Moran Junction, with the beautiful Tetons in the background. Once we got up near Togwotee Pass, we discovered the infamous construction zone that everyone in the area seems to bemoan and avoid. We were not allowed to ride through a ten-miles stretch of the area, so we had to ride in the Pilot Car that escorted vehicles through the area (see video at bottom of post). We also were not able to ride the dirt road up to Brooks Lake, which was unfortunate and meant that we had to ride more miles on pavement; the road was blocked off due to TNT near the junction. I guess you could say that we had an easy climb up and over Togwotee Pass, our 8th continental divide crossing of the journey. One disclaimer I should mention before the critics begin a rant: Matt and I have each ridden this pass in 2006 when we both took cross-country cycling trips (him on a bike and I on a unicycle). No doubt, the landscapes and challenges on this journey have been tremendous. However, rivaling their greatness are the people we have met. I may sound like a broken record, but each expression of gratitude is sincere and immense. "Trail Angels" Dave and Jo-An Martin fed us refreshments and refilled our water at their cyclists-only hostel, even though we arrived unannounced. 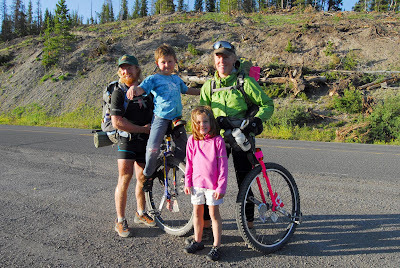 I think the reality of the "unicycle" part of our journey didn't really sink into their perception of our adventure until we mounted up and rode down their driveway up toward Union Pass. ... and ... happy birthday to me! I just turned 26 yesterday and it proved to be an excellent day, indeed. Just after I awoke, I heard footsteps coming over to my tent and began to see a yellow glow on the other side of the tent wall. "Happy birthday to you, happy birthday to you..." Matt began to sing. He brought a blueberry muffin with candles that spelled out "26" and a card addressed "To Grace, Destroyer of Miles." To top it off, he included a cinnamon roll in the birthday breakfast. Talk about being spoiled! It helped broaden my smile that had become more a look of surprise when I discovered ice lining the inside of my tent and part of my sleeping bag. Yep, the cold has come!! [What more could a girl want? On our continued descent from Mosquito Lake (aptly named) to the Green River, we each made a "Three Ocean Cocktail," which consisted of water from three streams that are the headwaters leading to the Atlantic Ocean, Pacific Ocean, and the Gulf of California. Just add Tang, and it was a treat. We continued rocking our descent into Pinedale, stopping for a wonderful cafe breakfast at "The Place" along the way. Just outside of town, a lady named Kathy Raper stopped us who had seen us earlier that morning on the road. We got to talking and found out that her daughter is a Non-Hodgkins Lymphoma survivor, and she helps with an organization called "Kicking Cancer," which aids families with costs of cancer treatment that health insurance doesn't cover. Just when we were intolerably parched, she offered us water and (gasp) ice, and made plans to take us to dinner. Not only did she treat us to an amazing Mexican food dinner, but she brought us angel food cake, berries, and whipped cream to enjoy as a dessert on my birthday. Dang!! Her generosity extended much further than just the tangible gifts, and we are so thankful for her encouragement, enthusiasm, and all the work she is doing in the community to help others battling cancer. Thanks again, Kathy!! Well, that's life from the road. We are preparing to take on the worst (best?) of the Great Basin and are trying to get creative in ways to carry more water on our unicycles, not on our backs. Wow those are some great photos! The Teton Freedom Riders applaud you! Stop by our trails anytime. Keep on truckin'! See you soonish! Glad to hear Matt hid that roll and muffin (and candles!!) only to surprise you on your birthday morning! Good job, Matt! The views look amazing. We're thankful for the "road angels" you meet, and the encouragement and goodies (ice!) they provide. OH boy there girl! We HAVE to talk!!! I am thoroughly respecting you and enving you like there is no tomorrow for doing the Divide on UNI !! Wow! I am so so impressed. I am having the BEST dreams EVER as *(in part) as a result of your accomplishment and efforts. Way to go Matt, too! How do we keep in touch? Bravo! Please lets talk; I hope I find you on Facebook or somewhere. Oh I know just come to Banff, Alberta - Canada. k? There must be a persistent focus on doing the work and mastering the task at hand rather than the dream of winning. Many results can never be controlled – only your effort and level of skill can. If you build your fitness to the highest possible level, pace your race well and make sure you are completely spent at the finish line, feeling certain there was no way you could have run cycled skied etc. an extra inch – then I believe, you have reached the limit of your potential that day and whatever the results you get; you should be proud of. Success becomes an overwhelming feeling of joy as you’ve over came the obstacles you’ve set for your self. I believe, Much of success lies in the journey. I'm sure the original dream was private; then became a reality in the *Power of believing. You sure seemed like you laid it ALL on the track; meaning the Divide! This is what I tell all the kids and youth and homeless people I run into in private. And you surely didn't wait for it. Have you tried it from Banff yet?